This house was built in 1910; roofs, floors, doors and windows originals. Rooms are located at the upper level and are provided with vents, shared bathroom (hot water) and colonial styles furniture. The house also has a living room with tables and chairs and a terrace where you can take sunbathes or order breakfast or meals as you wish. From the balcony there is a wonderful view of the town, the sea and mountains. 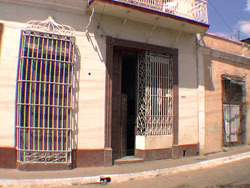 The house is located at 500 meters from Plaza Mayor, 100 meters from comercial zone and Cespedes Square. 25 CUC per room per night.